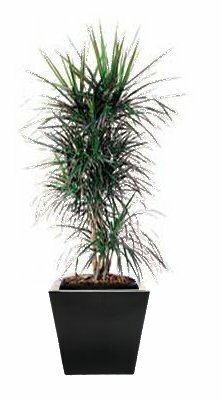 First lets assume you already have your plant or tree and you have found just the perfect planter for it that will fit the great location. If you need some advice in that area please see: How to Find, select and buy the proper planter. before going any further. You have several options when potting your plant, depending on if you intend it to be for indoors, outdoors or both. First consider: If outside do you need it to drain? Usually so or it will turn into a bog after rains. Will it be in an area that freezes? Some planters like ceramics may not be the best choice outside in these areas. Is there a strong wind possible? You may need to add some ballast or consider a very heavy planter. In that case you may want to up-size it a bit. If used inside the above may not be a problem but also think about the plant and the location it is to be used in. We don't want a top-heavy cane or palm to fall over when the cat jumps on it do we? 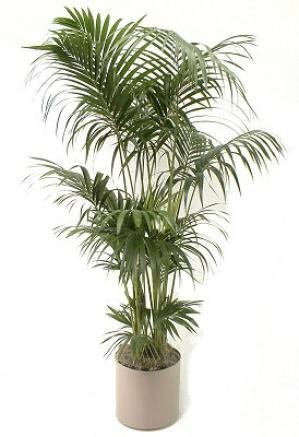 Inside (tropical) plants: The way we recommend it - is to leave your plant in the *grow pot and just drop in the decorative planter / liner. Obviously the new planter will need to be a couple of inches larger to accept the grow pot as well as deep enough to hide it. It is a good idea to use a cheap, saucer "inside" the liner to catch water so it wont just rust, sweat or rot your plant. 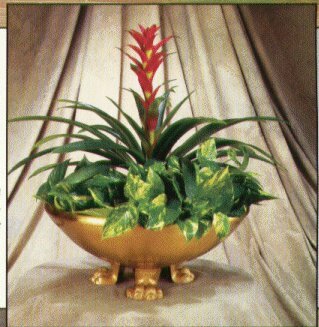 Remember most houseplants do NOT like to sit in water, so you don't need a huge saucer but one is recommended. Some folks like to put in some stones to raise the plant up a bit instead. I don't really like that because of the danger of future leaks, mold, smells, etc. Nothing smells worse then old stagnate water! We also recommend some type of pad under the planter to further protect floor surfaces from scratches, and any future possible leaks. Even the best planters can develop a leak or sweat over time if water is allowed to stand. Fertilizers also can eat away at the inside of planters causing corrosion..
*Grow pots are the cheap, plastic containers plants come in from the greenhouse. After Using the techniques above you will want to spread a nice Spanish moss, stone, bark chips or some other ground cover (I like to use Ivy when practical) to finish off the job. 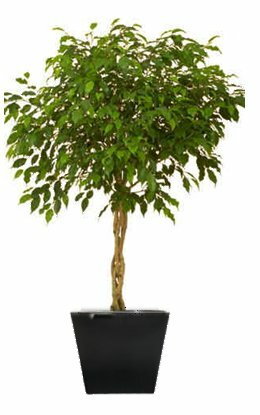 Your plant should now look great and be very easy to care for. If it ever needs to be replaced, you can very simply pull it out and set the new one right back in...No fuss no mess. Don't fertilize for the first few months. Outside: Depending on location, size and materials you may be able to use the same technique as above but often you will need to direct plant your tree into your planter. First cover the drain holes (if any) with some window screen or other very porous material to prevent the loss (and mess) of soil and pebbles. I do like to have an inch or two of stone drainage included before planting just to be safe, but it is not always necessary. Fill the bottom with some good quality soil and place the plant in the container, leaving an inch or more at the top so soil wont run out when watering. It's a good idea to loosen up the roots (root ball) before doing this. If the root ball has a tarp or strings, cut this before planting. Some root bound trees need to have the roots cut a bit to encourage growth also. Don't go crazy but take a sharp knife and just make a bunch of slices through the outer roots. This will encourage new feeder roots to grow. Water it in well and check for any air pockets or settling, fill in as needed. Again, a nice ground cover will finish it off nicely. Coming next: How to direct plant (if you must) inside or out. How to buy, install and use self watering or sub irrigation systems. Congratulations on your new Planter Designs metal product. To ensure a life-long and scratch-free gloss and shine to the metal surface, proper maintenance must Be followed. Unless otherwise specified, all our solid Brass and bare metal products are clear coated with a water-proof finish designed to give the surface a long lasting gorgeous color and protective shine. No major maintenance is required. To preserve the finish, wipe products down with a soft, scratch-free, damp linen cloth. Do use any polish on the lacquer finish. If a product is specified without any coating, you may follow the directions below on maintenance and preservation. ATTENTION: Never use scour pads (such as 3M Scotch Brite) on any products – this will destroy the finish. Always keep your products covered if stored in weather elements unless specified for outdoor use. time. If your brass product is unfinished, clean using a mild soap and warm water. To polish, use a soft dry cloth and Brasso cleaner (or other equivalent brass cleaner). Buff with a soft towel. Copper has the polished appearance of a freshly minted penny. Like brass, unprotected copper will tarnish in time. If your product is unlacquered, use a soft dry cloth and Brasso cleaner (or other equivalent copper cleaner). Buff with a soft towel. Bronze is a weather resistant alloy which needs minimum care to maintain its shine and beauty. For unlacquered bronze, use a soft dry cloth and Walter solution, as needed. 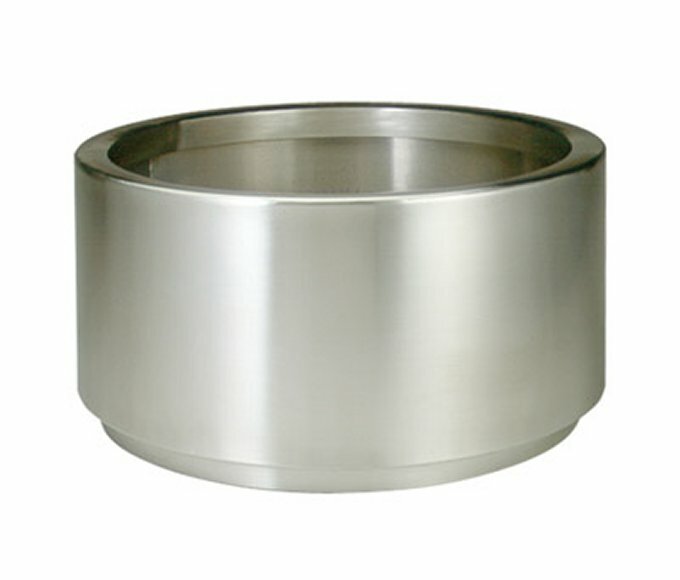 Stainless steel is the most sought after metal at Planter Designs, It is a combination of steel alloy, chromium and other elements. Stainless steel has a silver like shine however the appearance can dull over time, so proper maintenance and care is required. If your product is without our clear-coat lacquer, use a solution specifically designed for stainless steel. Water, Gloss or Flitz will work just fine. It will often come in a spray or cream. Rub gently with a soft dry cloth until you are satisfied with the shine. Buff with a soft towel. Avoid any harsh chemicals or abrasives. 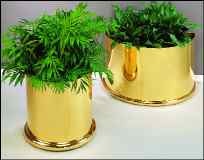 PLANTING IN YOUR SOLID BRASS OR METAL PLANTER! 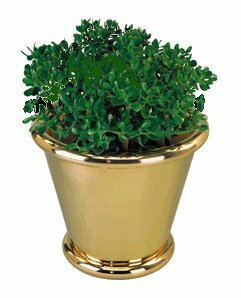 Nothing is more beautiful than a lush plant or tree set into a classic, solid brass, Copper, Bronze or stainless steel plant container. Remember, that these hand-made planters are not designed to have direct planting (loose dirt) in them unless a good quality liner, like our sprayed in fiberglass liner is used. The soil, water and planting chemicals can eat away at the metal over time and cause a leak, as well as damage to your planter investment. If no liner was included in your planter, use a heavy duty trash bag and a saucer under the (plastic) grow pot that is then set into the decorative metal planter. A nice ground covering of something like Spanish moss or bark will finish it off nicely and hide the liner, pot, Etc. 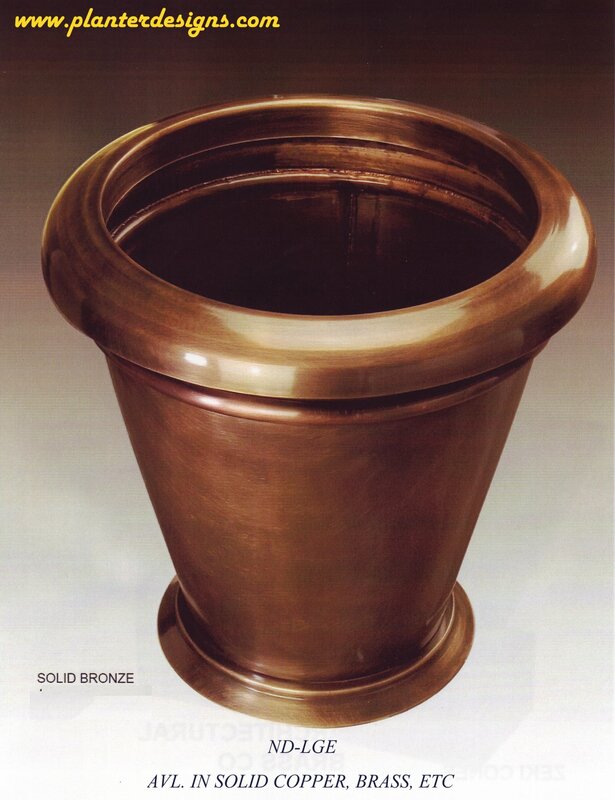 With proper care your Beautiful solid brass planters should last for generations. A little wear just adds to the patina. How to Find, select and buy the proper planter.